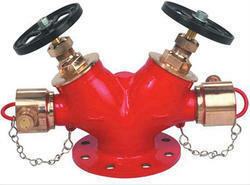 Our service range includes a wide range of hydrant system, foam based system and water based system. Water has long been a universal agent for suppressing fires, but is not best in all cases. For example, water is typically ineffective on oil fires, and can be dangerous. 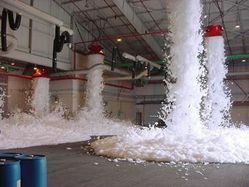 Foam based fire protection system used for fire suppression. Its role is to cool the fire and to coat the fuel, preventing its contact with oxygen, resulting in suppression of the combustion. During a fire, foam based fire protection system spread large scale foam blanket through foam pipes, foam monitors, sprinklers or nozzles.The foam is applied on the burning material, extinguishes the fire and serves as deterrent against re-ignition. 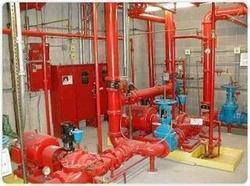 Foam based fire protection systems are suitable for protecting high risk flammable liquids. Water based suppression systems utilize the inexpensive and readily available medium of water to discharge onto flames through a normally fixed piping system. There are 4 main types of Water based Protection Systems. The risk to be protected will determine the most suitable type of system you need.